Filters Toxic Ammonia Caused By Waste Materials. Provides For A Healthier Environment In Your Bait Tank. Reduces Baitfish Losses Due To Diseases And Poor Water Quality. Removes Up to 40 Grams Of Ammonia Per Each Kilogram Of Weight. May Be Used With All SURE-LIFE® products. May Be Used in Minnow Tanks, Vats Or Truck Tanks, Livewells, And Shad Tanks. Ammonia is a by-product of fish waste and other decaying matter in the bait tank. It is extremely toxic to fish, since it burns their gills. In water, ammonia exists in an equilibrium reaction whereby both ammonia (NH3) and ammonium ions (NH4+) exist at the same time. Although ammonia is toxic to fish, ammonium is not. Which of these two is more abundant in the water is dictated by pH. At a low pH, the non-toxic ammonium ion is prevalent while at a higher pH (greater than a pH of 7.0), the toxic ammonia molecule is prevalent. AMMONIA-EXTRACT™ is an ion exchange resin which works best when placed into the filtering system. The AMMONIA-EXTRACT™ granules are coated with sodium ions (Na+) at receptor sites. When placed in water containing ammonia, the sodium ions at the receptor sites are exchanged for ammonium ions. Since the ammonium ion is actually removed from the water and the equilibrium reaction, the reaction must shift, and a toxic ammonia molecule changes into a non-toxic ammonium ion. The AMMONIA-EXTRACT™ resin actually removes toxic ammonia from the water by removing the ammonium ion with the exchange of sodium ions, thereby forcing the ammonia to convert to the non-toxic form. Rinse the light tan granules of AMMONIA-EXTRACT™ well before using, with clean, cool water. As a rule of thumb, use 3 pounds of AMMONIA-EXTRACT™ per 100 pounds of fishbait. Best results are achieved by placing AMMONIA-EXTRACT™ in nylon mesh bags either in bait tank filters or directly on bottom of bait tank. This product may be used with or without charcoal and in Diatomaceous earth filters. 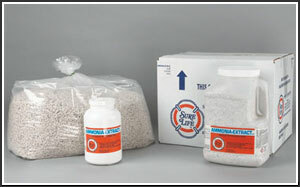 You may monitor ammonia removal with any ammonia testing kit. To recharge AMMONIA-EXTRACT™ for reuse, simply dissolve one half pound of SURE-LIFE® (Bait Tank Salt) in one gallon of fresh water. Use this solution to recharge 1/2 pound (8 ounces) of AMMONIA-EXTRACT™ by leaving the AMMONIA-EXTRACT™ in this solution overnight with aeration. Once recharged, remove AMMONIA-EXTRACT™ from recharging solution and rinse well with clean, fresh water before reusing. Discard AMMONIA-EXTRACT™ and replace with new material when product becomes extremely discolored or after 10 uses, whichever occurs first.